By a show of hands, how many readers can make the association between the title of this post and a particular Steely Dan tune? A while back, Straight Guy tweeted that he’d introduced his kids to The Three Stooges…and was happily recounting that they *got* it. One generation passing the slapstick-torch…I found it comforting and amusing all at the same time. I mean, he’s a guy…and it’s The Three Stooges. Of course he’s happy to pass on that kind of humor…I can only hope that he’ll stop just short of the “pull my finger” joke. Kathryn: “Well Connor….I can’t tell you how happy I am we’re finally sitting down to discuss the advantages and ramifications that technological advances have had on your short but astoundingly meaningful lifetime. Anything you wouldn’t want your kids to know that YOU did as a child? Nah…I’ll bet every one of you were perfect children….am I right?? I hope you really do have a martini glass with Clinton Kelly's name on it! Love the convos with you and IV. Can I have a martini now?? I have my grandparents black rotary phone. We used to have a party line and that was fun! of course I was perfect! IDK, I grew up differently then how my daughter will grow up. Son the circumstances for what i did is different. I don't think I'd want her to know all about my childhood because then it'll give her free reign to do what i did, and I don't think that'd be a great idea. I will share one story. When I was 12 I went to my friend's farm which was at the time an hour away from my house. Her mom was very permissive so we did a lot of stuff we shouldn't have. Boys came over and we were on the roof. One of the them was smoking a cig and everyone else except my friend and i were drinking beers. Remember, we were 12. Anyways, they all had about 1 beer and then we decided we wanted to go to the bowling alley. One of the boys had a chauffeur so we went without telling our parents. Maybe that wasn't my worst childhood adventure, but it's the most sane for right now. My dad flipped a lid over the long distance bills too, particularly when I was in the 10th grade, and my first "real" boyfriend lived in a town 50 miles away...ah, memories! I've been slowly telling my mother the TRUE stories of what went on during my younger years. It's really starting to drive her nuts. Not sure I'll tell The King...unless he asks. 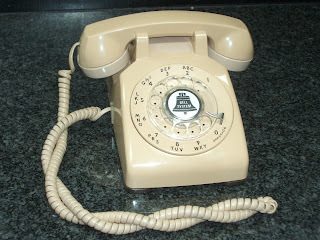 OMG...the second I saw the photo of the rotary phone I HOWLED!! You have no idea how many memories it brought back for me as a child. And I totally forgot about the "lock" but the when I saw it, I remembered it being used on my father's office phone. I was so lucky because when we got older, my parents actually installed our very own telephone, with our very own telephone number in our rooms - can you believe it? And yes...I was a PERFECT child. Make fun of the rotary phone all ye like, but I really miss the old-fashioned handset. It was so much easier to cradle between your ear and shoulder. With today's modern phones, there's NOTHING to cradle. My neck hurts. I hate phones. The phone part of this is hillarious to me. That rotary phone picture bring up tons of dialling memories. You have such a great way of telling stories. "Anything you wouldn’t want your kids to know that YOU did as a child? " 13 year old stepson asked me what a record was the other day. YIKES. He does like the Three Stooges. Bought him a DVD of old episodes last Christmas.... Ah, some things never change. carissajaded: Oooh! You're making me shake just thinking about those stomping footsteps that meant "Dad was coming...and he was M-A-D"! We're lucky we survived to adulthood! Spot: Here's your martini, my dear. BTW....I had to Google "prevaricating". (Showoff.) I'm too afraid to tell da boys half the crap my siblings and I did. It seems like I'll bring something to life if I do! book*addict: Well, I totally hear you about being afraid to put ideas in our kid's heads. And...hello?....12yo and smoking AND drinking? on the freakin' roof?? I realize you weren't one of the offenders, but still...you DID have a LOT of freedom, I'm guessing. Allegria: Uh-huh. Party lines and perfect children....and that's the way it was!! Gingerella: WOW...50 miles! That's a LOT of walking for a 10th-grader! Yeah, it's funny how we yearn for the "days of yore"...and I HAVE that old-time ring for my cell! Score! Erin@TheLocalsLoveIt: Yeah, we STILL haven't clued in Dad. Some things are better not shared, I think! Yes I thought of Steely Dan the second I saw your post title on my dashboard. My older sister was responsible and studious growing up so my parents gave me a lot of freedom assuming I too would use it wisely. Boy were they mistaken. What I got up to isn't fit for public consumption, suffice it to say I was a hell raiser. My parents didn't know what hit them. JD at I Do Things: I totally hear that! You're right, my dear...nothin' left on those itty-bitty phones to cradle. How'd you get to be so smart?? Tom Bailey: Thank you, kind sir! Always happy to hear from you as well! Smileyfreak: HA! I'm sure you were (cough) perfect! And I'm sure your kid would NEVER (cough) text all night! Gavin: HA! Isn't it funny? It's "do as I say, not as I DO!" I think we'd all be in big trouble if our kids did what WE did! Collette: OMG! I don't think my parents thought to do that...or I know they would have! We must've tortured them, right?? Well naturally I never talked back to my parents, but somehow I did talk them into buying me my own phone (alas, not phone number) when I was 13. It was a beautiful baby blue princess, and the dial had that soft touch like a cat's purr rather than the hard dial like the one in the picture (our hall phone). I remember maybe 10 years back my kids were aghast that I grew up without a VCR and movies on video. Yes, we actually had to go to a movie theater to see a movie. Things have already changed for them considerably since then too. Thanks for the memory lane trip! And I love that steely dan song. By a show of hands, how many readers can make the association between the title of this post and a particular Steely Dan tune?" It's FM, baby. EFF EMM!!! Gropius: OUCH. I've been meaning to share The 3 Stooges w/da boys...I can't imagine that slapstick is ever NOT funny. It doesn't always have to be about special effects, right?? Maureen@IslandRoar: Oh, so perfect! How is it that I've never heard of Saint Maureen?? Dreamfarm Girl: Oh, how I longed for a baby blue princess phone! Such memories....(sigh). I'm reminded of how easy our kids have it each time we lose power...they don't know what to do with themselves! Heather: Yeah...the push button. All new-fangled and required so much less energy to dial, right? MeanDonnaJean: THANK YOU! I NEVER tire of this song....nevah!! Well my babies are 23 and 27 now so pretty much I've done all the damage I can...lol. But hey, know what I remember? Party lines! We always lived out in the country and we had a party line where everyone was on the same line and if you were on the line someone else in another house could pick up the phone and listen in and vice versa...I listened in quite a bit. Wow, K, thanks for the shout out. Just so everyone knows, don't spring the Stooges on your kids unsuspectingly, start slowly with a few vintage "I Love Lucy" clips (recommend the chocolate factory and grape stomping episodes) easily found on YouTube. When you get to the stooges, look for any clips featuring the trio fleeing a gorilla on the loose. Good times. Alicia: OMG! You're not the first person to mention this...I'm very jealous! We didn't have a party line...but I DID live in the suburbs. I feel cheated! Straight Guy: You're welcome! I just love the face that you're passing the torch...and I'm going to seriously look up those classic Lucy eppys. 3 Stooges fleeing a gorilla? Da boys'll LOVE that! "Hurry the bottle, mama, it's grapefruit wine"...at least that's what I've always heard; watch the lyric be something completely different, like your Vlingo experience!! My 17 yr. old niece gives us crap because we still have a corded phone. "It...plugs into the wall!! How stupid is that? You mean I have to STAND here to use the phone?" Hey, I didn't buy a pushbutton phone until my wife got sick of not being able to access any customer service ("Press 1 for...") because I clung to my rotary dial! Straight in Upstate: Oh, God...you're my HERO! I think. Wait. Do you have a technological aversion to everything? Or just the phone? 'Cause if it's just the phone, I think it's fantastic! Get this: I've just Googled the words! It's "Worry" the bottle, mama! I always thought it was "hand me", but the guy was slurring 'cause he was...ya know, drunk! Oh dear, hero-hood hangs in the balance. I'm obviously not a Luddite because I'm addicted to blogs and Facebook. I don't think I have an aversion to tech. so much as a healthy skepticism, especially regarding content and quality. Why do I need a MP3 player when the sound quality is horrid and I'm paying for (or at the very least, reformatting into) something intangible (an audio file)? Is this really progress? I prefer my banjo to a lot of the latest-and-greatest tech I'm supposed to be buying (as you know from the other blog, I may not really be straight because I don't want to buy a 6-foot flat screen HD TV). So if I've blown my shot at hero-dom, so be it - GG hadn't even sent my swatches yet for my cape. i never would have guessed "Worry the bottle" as the correct lyric! Straight in Upstate: HA! Well, you've made me smile several times today, so your Hero-dom is hereby granted and upheld. Even if you DO still listen to those old vinyls! I can tell you I'm the only one in my circle who doesn't have satellite radio, but I DO have an iPod. Yeah..."worry the bottle"...at least, that's what the first 2 sites I checked said...and one of them was supposedly the "Steely Dan" site. I've decided to sing "Hurry the bottle", 'cause it makes a hell of a lot more sense! Favorite line from The Incredibles: "
No more capes!!" If you haven't seen it, it's worth it. Straight in Upstate: Now, how could I have missed such a classic? If it's ON DEMAND, I shall find it.